Everywhere I seem to look, I can see the conspirators working relentlessly through the media propagandists who are attempting to re-arrange your reality to become the reality that they want you to believe in (Revelation 3:18). While walking through the Chicago airport yesterday, I went into several of the stores where I could see the attempt to exchange a lie (Ephesians 2:2) for the truth on every shelf. As I gathered information for this article to verify everything that I am putting forth, I noticed that the communists are hard at work attempting to attack and discredit anyone and everyone that tells you the truth which exposes their lies. 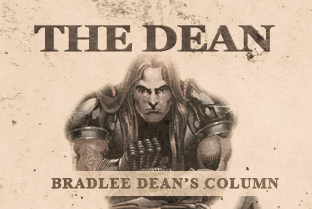 Bradlee Dean is a “Lying Preacher,” “Gold plated conspiracy theorist,” “Devout conspiracy theorist” etc… These are some of the things that have been said by those who attempted to denounce the truths about the sodomite communities. They have all turned out to be conspiracy facts. “We'll know our disinformation program is complete when everything the American people believe is false.” -William Casey, CIA Director, 1981. Let me go back to the Chicago airport store shelf propaganda. On the front page of one of the magazines, I read “Hillary Clinton: Front Runner Pad Primary Leads. Her campaign literally has no support! She is propped up from beginning to the end; and the end of this nation as you know it if you do not deal with her crimes, as well as those who are helping her along to commit the crimes. Then, we have Ben S. Bernanke, former Federal Reserve chairman, with his new book “The Courage to Act.” This is the man that took $2.2 trillion of American tax dollars to loan to banks with anonymity. The bankers did not want Americans to know who received the money. Ben now admits Wall Street executives should have been jailed. Who is Ben conveying courage? It certainly is not to himself. Then, we have the communist and immoral criminal in California Governor Jerry Brown on the cover of Newsweek. The headline was “Altered State: How Jerry Brown Secretly Saved California.” Friends, you cannot make this stuff up! Brown has pardoned dangerous criminals for their crimes and released some back into America’s population, signed legislation against the Second Amendment, signed two transgender bills making “gender identity and expression” a protected class of people, who are abominable and mentally ill (Romans 1:26), etc. Altered state is correct through the lies that they promote. As I have shared in the past, they know how to lie better than Americans know how to live the truth (Luke 6:46). Destroyers are made out to be the saviors. The immoral are propped up to be the standard. Concerning the entertainment world (Mattew 4:9), we have the lewd and baser Nicki Minaj on the cover of TIME magazine as one of the most 100 influential people. Influential? To whom are speaking? They love to prop up their own (John 15:19). America, you now have the atheists trying to convince you that God does not exist. Yet, He is all they spend their time fighting (Psalm 14:1). You have a white woman that claim that they are black. Rachel Dolezal, the ex-NAACP leader, says “I identify as black.” You are to accept that lie! You have Massachusetts Senator Elizabeth Warren falsely claims to be a Native American. Now, Bernie Sanders is floating her as a possible Vice President. You have Olympian Bruce Jenner that says he is now a woman. You are to accept his perversion and confusion as the norm. You have Al Sharpton, who is a tax evader, thief, racist and counterfeit civil rights leader being praised on “60 minutes” as a reverend (Micah 3:5). You are to accept that former Vice President Al Gore is now a scientist for his “climate change” discoveries. Colossians 2:8 Al is now being sued by 30,000 scientists for global warming fraud. You are told that George Stephanopoulos is a news anchor even though he has been outed as a Clinton crime family operative (Revelation 21:8). You have been dumbed down enough to believe that the Barack Hussein Obama bowing to Saudi kings and transgressing the Constitution of the United States of America is Presidential (Deuteronomy 28:36). All of these are “useful idiots,” every single one of them. That includes the president, as well as those who accept these lies (Isaiah 59). They prosper, knowing that the people in this country will accept anything and everything and yet, do nothing about their crimes. They bank on it, literally. They love that you accept their lawlessness. This is why they are endlessly promoting it. After all, that is how they prosper, through deceit (Daniel 8:25). Today you are dealing with the very issues that I warned you would come, but they were just conspiracy theories! Prevention is better than cure. I have tried to warn you as to what they wanted this to become.